A few nights ago, around 9:30, my car horn start honking repeatedly. I was up here alone, and wasn't sure if I should grab a Rottweiler and go investigate, or hide in the house. I chose the second option. Then, at 2:15 a.m., it started again. I was starting to get creeped out. A trip to the Santa Fe Toyota dealer solved my problems yesterday, it was a sensor going beserk. 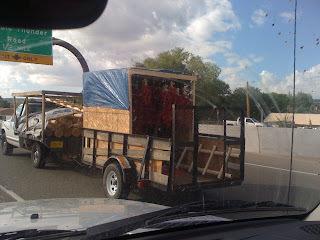 On my drive down there, I got excited to see this trailer full of fresh chile ristras, headed for someone's home in the future, whether to be eaten or for decoration. It is another harbinger of fall; I remember my neighbors in Chimayo telling me they hung them in their attic space to dry and store during winter. YUM...nothing like good Chimayo red chile sauce. And while Oprah would have admonished me for using my telephone camera while driving, I decided this bridge was too cool to pass up. I apologize for the quality, I was driving into the sun when I took it. 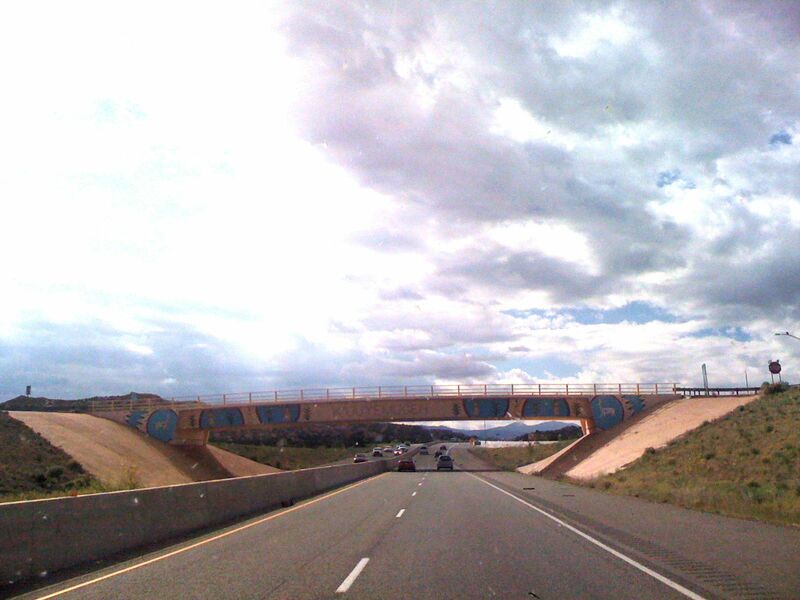 This was one of several art projects that happened with the Indian pueblos redid the roads north of Santa Fe some years back. I love that they celebrated their culture with art in a public place. LOL Love the post title. The car does sound possessed. And don't feel bad - I would have chosen option 2 also. Back-to-back chile posts . . . you're making me hungry. There's nothing like fall in NM. Enjoy! So glad to see you back in Taos. Spooks in the machine? Know the feeling. Thank you for commenting during my downtime and damage from the storm. Finally got back up this afternoon. They worked on this on a Sunday. Hope it stays up. We'll see. I envy your falls in Taos. Used to go up every time I could from Amarillo. A trailer load of chile ristras! That's definitely something I've never passed driving down the road in Minnesota!